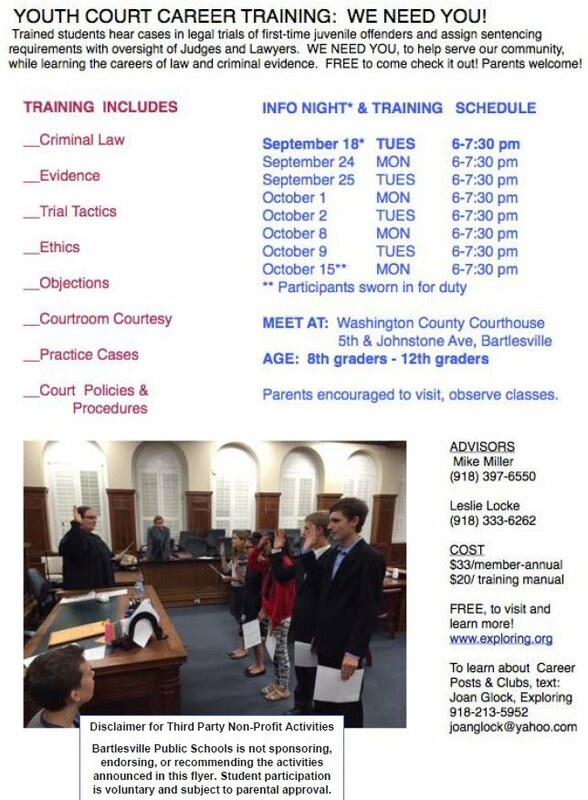 Interested students in grades 8-12 are urged to attend Youth Court Career Training. The result of the program is that trained students hear cases in legal trials of first-time juvenile offenders and assign sentencing requirements with oversight of judges and lawyers. Students can help our community while learning about the careers of law and criminal evidence. There will be a FREE initial informational meeting on Tuesday, 9/18 from 6-7:30 p.m. at the Washington County Courthouse at 5th St and Johnstone Ave downtown. If you are interested but can't make it on short notice, you are welcome to join in the next meeting on Monday, September 24, also from 6-7:30 p.m. at the courthouse. This is an Explorer program sponsored by Mike Miller and Leslie Locke. Participants are trained in criminal law, evidence, trial tactics, ethics, objections, courtroom courtesy, practice cases, and court policies and procedures. Parents are encouraged to visit and observe classes. To learn more about the program, contact Joan Glock at 918-213-5952 or joanglock@yahoo.com.